This year's LA Design Challenge has chosen "Motorsports 2025" as its theme, and we've already shown you Mitsubishi's entrant: the MMR25 Rally Racer. We're close enough to the show that the rest of the field has finally revealed itself and includes far out concepts from the likes of Audi, BMW, General Motors, Honda, Mazda, Mitsubishi, Mercedes-Benz, Toyota and Volkswagen. Follow the jump to check out high-res galleries of entrants like a baja racer with an aerial reconnaissance drone or a Le Mans racer with a robot co-pilot that looks like a cross between R2-D2 and Hal. 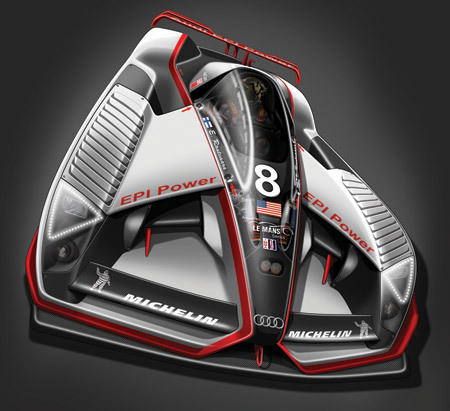 Then there's the globe-trotting racer that can compete on land, air and water, and the Chaparral-inspired hybrid racer. They're all amazing ideas and show just how much imagination these designers keep bottled up between sketching the next-gen Camry and redesigning cupholders.